Ernesto de la Cárcova was born in the capital of Argentina and from a very young age, he devoted himself to painting. He travels to Europe to continue his studies, but without losing touch with the reality of his country. In 1892, in Italy, he began working on his most famous canvas, Without bread and without work, which completed once he returned to Buenos Aires. To appreciate the painting, it is necessary to understand what was happening at that time in Buenos Aires. Caused by the country’s economic growth, the city experienced a strong influx of immigrants from Europe. Spanish and Italians settled in Buenos Aires and its surroundings and, in mid 19th century, half the inhabitants of the city were foreigners. They brought new political ideas with them, e.g., socialism and anarchism, closely linked to the labor movement. In 1890 begins the “growth crisis”, one of the worst economic crisis in the country. Many workers lost their jobs and social tension raised, resulting in constant demonstrations and popular demands. 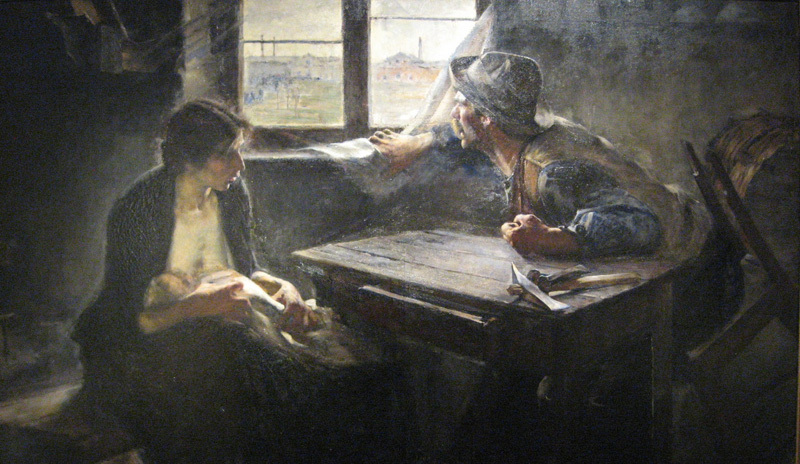 Without bread and without job, probably one of the best examples of Argentinian painting, shows the reality of a working family of the time. The characters are sitting in a humble and obscure room. The man leans out the window, where we can see a landscape with smokeless factory chimneys. A working demonstration is being suppressed by the mounted police and the worker, angry, hits the table hard. Over it, work tools are abandoned, useless. To the left of the composition, we can see a thin woman, the mother, breastfeeding her baby. What I like about De la Cárcova’s painting is that it is unaffected by politics. At least not explicitly. Instead, the artist shows us a scene essentially intimate and personal. ~ by Álvaro Mazzino on June 8, 2012. Excellent. Thanks for your commentaries and descriptions. Sony introduced the 2015 flagship Xperia Z5 as the “smartphone with the best camera unit.” Now, DxOMark, a Website famous for ranking camera sensors, has apparently custom tested the smartphones like Xperia Z5, Google Nexus 6P, and many Samsung and LG devices. This entry was posted on June 8, 2012 at 16:40 and is filed under Realism.You can follow any responses to this entry through the RSS 2.0 feed.You can leave a response, or trackback from your own site.